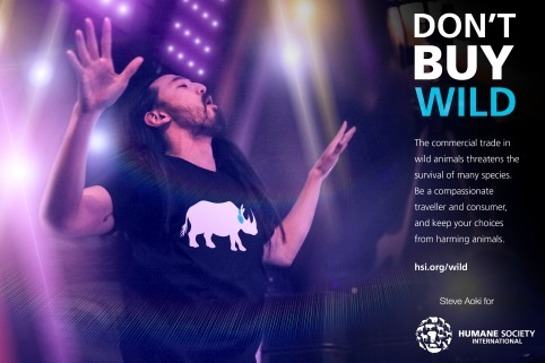 World-renowned DJ Steve Aoki has joined The Humane Society of the United States (HSUS) and its global affiliate, Humane Society International (HSI), in their combined efforts to combat wildlife poaching. Aoki also designed a limited edition t-shirt available at Represent.com/SteveAoki, featuring artwork of a rhino donning headphones and the artist’s name on it. All proceeds from the sale of his shirt will benefit The Humane Society of the United States. More information on the rhino horn trade can be found here.